BLOG > Get hooked on HOOKED! Win a free signed copy! Get hooked on HOOKED! Win a free signed copy! Hi all, long time no blog. Very excited to announce my first picture book, HOOKED, has just been published. Let’s celebrate with some free signed copies, shall we? The story of HOOKED is based on a real-life adventure I had with my son, Joe. It involved going to a pond one cold winter’s day and undertaking a certain activity. 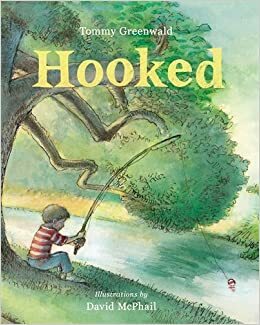 What activity did Tommy Greenwald and his son Joe do, that inspired the book HOOKED? Please enter your answer in the comments section of this post — and good luck! C Ice fishing! Love the Joe Jackson series! Can’t wait to read hooked. Just saw a demo this weekend…can’t wait for my kids to read the book! Do you live in Westport?